Photo courtesy of Earth Day Market. December brings with it brilliant skies and an even more brilliant set of markets. Get ready to stock up on favorite winter fruits and vegetables, some lovely gifty items (jam or pickles, anyone? ), organic wine and beer for that year-end party, and a wonderful selection of ceramics to serve it in. Or just head on out to the special events some of the markets are offering to rev up your holiday energies! The Earth Day and Nippori Markets are rolling out two (yes, two!) events each this month that promise to be wonderful, while the old faithfuls carry on with their wonderful fare. Check the calendar and head on out to get the holiday season started right! This usually twice monthly farmers market is taking a short holiday this month. It promises to be back in January full of the usual fun, flavor, and foodliness! A fantastic two times this month, the Earth Day Market will have a regular showing of vendors this weekend and then their special event, Merry X'Mas with Fair Trade. The latter event will feature many of the markets wonderful regular features along with a wreath-making workshop (back by popular demand), amazing ceramics, and a bevy of international goods! 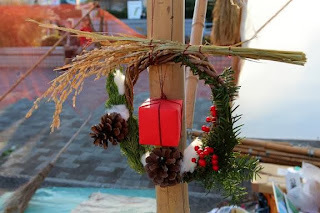 Like the Earth Day Market, Nippori is running one regular market day early on and then a holiday extravaganza that should knock your Christmas stockings off. The three day affair will feature a wine garden (like a beer garden, but with wine), live music, excellent food carts, gifty bits and most likely a wee bit of dancing. All that wine, you know.